Kaya Oakes gives us a tremendous amount to think about. She presents many portraits of the growing number of “in-between” people who constitute a large part of the present religious landscape. She began a project of talking with the “nones”- that amorphous category of people who choose no explicit religious identity when answering surveys. In her presentation of many of the stories of the nones, she shows just how varied and complex the situation is. The easiest response is for believers to places the nones into a fixed category; even more, to label that category with words like agnostic or even atheist. Oakes brings us more deeply into the lives of many of these people, revealing just how tentative religious identity is in the modern world. Very few of the many she has interviewed would call themselves “atheist”- by the same token, hardly anyone she presents easily accepts the label “Catholic” as a self-description. 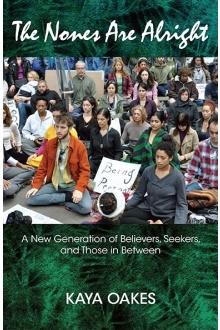 Oakes forces us to realize the massive changes that are taking place in religious identity. We have moved from a world where social cohesion aided the transmission of faith along ethnic and family lines. Rather, the world of Internet and choice has produced at least a generation of people who can easily visit other faith traditions, or put their own tradition on hold, as they explore who they are and what they ultimately believe. All of this is fascinating. Some of this is exasperating. While Oakes accepts some general identification with her own Catholic tradition, almost everyone she sketches expects the world, and the world of religion, to conform to her or his preferences. In an implicit, but very clear way, Oakes shows us that personal choice and preference has become the dominant criterion for being involved (or not) with religion, and on what terms. In image after image, we seek young people opting against one or another explicit form of religion because something strikes them as wrong, or not desirable, or too dogmatic, or not dogmatic enough. The deeper issue, of course, comes down to this: if a generation or two of people withhold commitment to specific forms of Christianity, how can people be sustained in the long run? What grounds them? What even gives people a platform from which to question or search? As younger generations drift from one Internet site to another, and one form of religious expression or another, or one form of the agnosticism or another, the Church, the communities and congregations of faith, will slowly vanish, if only for lack of membership. Pastorally, Oakes’s book seems to come down to a distinct approach for religious leaders: to be clear about what the Church has to offer people, to prioritize that offering so that younger generations can see what is crucial to the faith, and to be patient with people as they absorb one or another aspect of faith. The word “gradualism,” which emerged during the discussions at the synod on the family, seems quite appropriate as an approach of church leaders. If the core points of our religious commitment remain solid, then churches can handle more “messy” situations from the lives of young people. We may well never have anything resembling the 1950s again, but the future need not yield only endless leaping from one experience to another. The end result of that, it seems, will only be fewer people knowing what the Gospel of Jesus and the life of discipleship can really offer them. This book can help religious leaders more fully learn exactly what they are facing.